Mortal Kombat has been around for a long time. In fact, it’s still going strong with Mortal Kombat 11 being released April 23rd, 2019. This franchise can boast with over 20 video games (and 3 video game spinoffs and a crossover with DC Universe), two major movies, comic books, soundtracks, and it’s no wonder – numerous collectibles and merchandise. Today we’re going to look at 5 best Scorpion action figures. I get it. Most of us don’t have time to read through long posts. So I picked two action figures – one suitable for a low budget and one overall best from the entire list. If you have a little bit of time and want to learn more about each figure, then read on. While this may not seem as a typical action figure, I think it’s a great start for those who love the character and are on a budget. One of the best Scorpion action figures with 30+ points of articulation and is the most customizable with accessories. If you’re like most people, you will first look at the price, and that’s okay. After all, you need to know if you have a budget for it. Just bear in mind that price does not indicate the quality of the item every time. What you should look for next is definitely the size. Do you want a 6″ or 12″ figure? It’s good to think about how it will look displayed with your other action figures. Do you mind if they are all different sizes or would you rather have them all in the same size? It’s not always possible but I believe there are certain standards for the industry. You can read more about action figure size scales here. Not all action figures are equal in the articulation department. Some figures are made to be displayed in only one position and some may have 30+ joints, so you can tweak the tiniest details. It’s up to you and whatever you prefer. Slightly related to articulation are the accessories. Action figure with one pose is less likely to have any removable accessories like weapons. There are also various action figures which have extra set(s) of hands or even heads. Speaking of extra sets and accessories, it’s important to check the quality of the used materials. Of course, you can’t really unbox the action figure in the store and check, so make sure to read online reviews or ask your friends. You don’t want cheap plastic that breaks off when you’re adding accessories, or breaking the joints sa you move them. If you’re one of the people who don’t unbox action figures, this might not be that important. Good paint job can make or break an action figure! If you would like to expand your set with action figures from the same franchise/product collection, you might want to look at what the manufacturer can offer. Action figures coming from the same collection usually have a certain uniform style. If you like larger action figures, this 12″ Scorpion action figure by Mezco from Mortal Kombat X will be great for you. The whole figure is made of hard plastic and the mask can’t be taken off. The range of motion for the head is very limited due to the hood, so he can move only slightly from side to side. He comes with an extra pair of hands, two swords and a skull lantern. The hands can be switched easily. The lantern can be either held or there’s a hook on Scorpion’s right leg. This 6″ Scorpion action figure by Jazwares is inspired by the Mortal Kombat 9 version of the character. The details of his clothes are sculpted rather than drawn on, which is pretty awesome. He comes with two swords, which can be attached to his back via a peg. The swords are made from soft flexible plastic, which may be prone to breaking if not handled correctly. He also has one spear tip as an accessory. Thanks to the hard plastic of the hands and soft plastic of the weapons, it can be tougher to fit the swords in his hands, so care should be taken. He has about 15+ points of articulations, some joints may feel looser than others. Another 6″ Scorpion figure by Jazwares, this time inspired by his look in Mortal Kombat Shaolin Monks. This figure comes with its own black stand with the Mortal Kombat logo and two pegs, which makes it more stable for any pose. The yellow tunic doesn’t get in the way of posing since it’s modelled with soft plastic. There are nicely sculpted and painted details (like his head, bracers, and shin pads). He comes with 2 swords, 1 spear head and an axe. They don’t have much detail in them but I don’t think they’re really necessary. They fit really nice and snug in his hands and there is no struggle getting them on or off. The 7″ Scorpion figure from Storm Collectibles was inspired by the looks of his character from Mortal Kombat 2. It’s probably my most favorite outfit of his, it’s just so classic. He comes with 7 extra hands, extra face mask from Mortal Kombat 1, extra skull, wrapped up spear, straight bar spear, Hell Fire effects and an instructions booklet. The paint job is great, there are a lot of details sculpted as well (toes, shinpad bolts). The material of his hood and tunic is softer than the rest of the figure, the checkered look really makes it seem the tunic is padded. The hands and weapons can be removed and put on easily. There is no face sculpted beneath the mask, just a peg hole to make sure it stays in place. The forearm armor is sculpted separately and can be removed. The extra skull has a nice charred effect and also has a hinged jaw. The typical look of the brand’s product is reflected in this 3.8″ Funko Pop Scorpion figure. As is the case with most Funko Pops, Scropion doesn’t come with any accessories and the only articulation is in the rotation of his head. 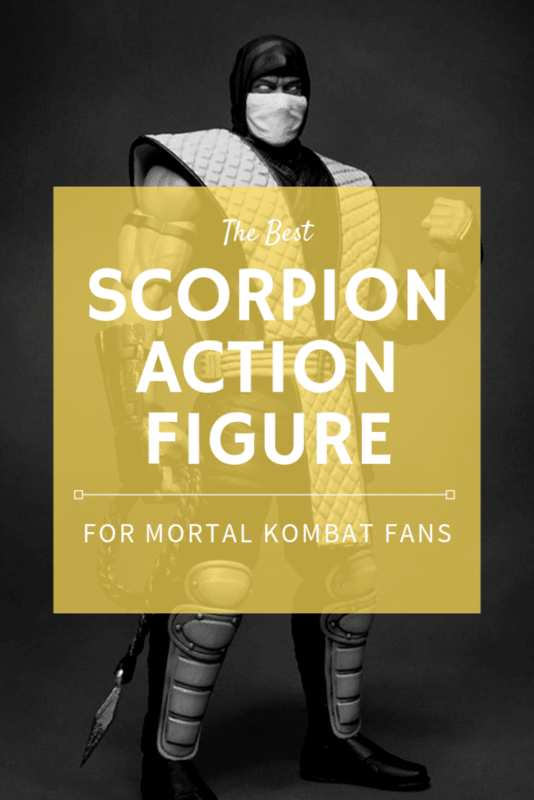 It might not be a typical action figure but it’s definitely great for the fans of Scorpion. The sculpting and paint job are really great. Funko certainly has the formula down, so you know what you’re buying when you invest in a Funko Pop. Depending on what you’re looking for in terms of style, size and your budget, I think the Scorpion action figures above is a great selection to choose from. If you’re on a limited budget and/or have a large Funko Pop collection already, I’d recommend the Funko Pop Scorpion figure. If you want to go the middle route with more articulation, I think Mezco 12″ Scorpion figure is a good choice. The best overall action figure in terms of look, quality, articulation and accessories is definitely the Storm Collections 7″ Scorpion action figure. Which action figure do you like the most? Let me know in the comments!